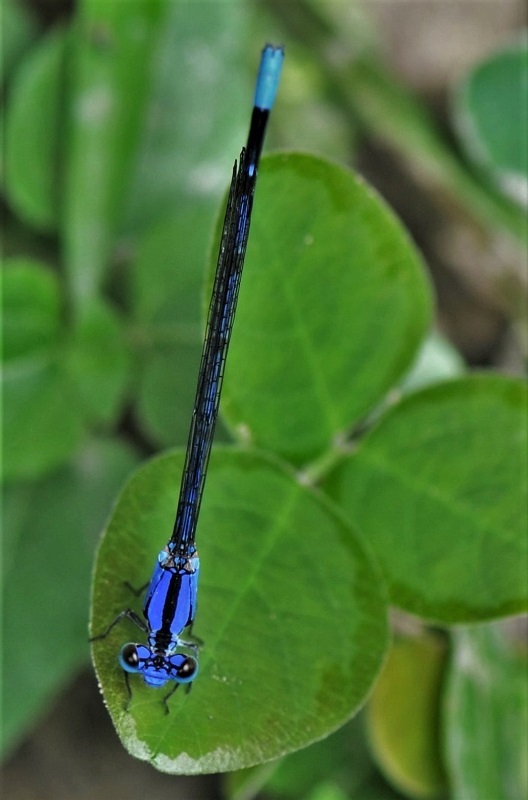 Damselflies are insects of the suborder Zygoptera, in the order Odonata. They are similar to dragonflies, the other odonatan suborder, Amisoptera, but are smaller, have slimmer bodies and most species fold the wings along the body when at rest, as can be seen in the picture. The compound eyes are large but are more widely separated and relatively smaller tan those of a dragonfly. Odonates are found in all the continents, except Antarctica. In the photo a bluetail damselfly (Ischnura heterosticata). Nice sharp details. Very good focus. Una foto preciosa de esta Ischnura! Me encanta el color que tiene, ese azul de su torax es estupendo. Muy buena foto desde esta perspectiva. Gracias por compartirla con nosotros y enhorabuena.